Sensor Networks Inc. (SNI) was founded in late 2014 to offer non-intrusive ultrasonic corrosion monitoring products to the Oil & Gas (O&G) industry. The founders of SNI and its key personnel have extensive experience creating unique solutions based on ultrasonic measurement techniques, including instrumentation, transducers, and specialized software. SNI solutions target all segments of the market including drilling, transmission pipelines, refinery, and storage. SNI products can be installed during new installations or retrofitted onto aging infrastructure, enabling the monitoring and calculation of projected failure dates so that maintenance can be performed and potentially catastrophic events can be averted. 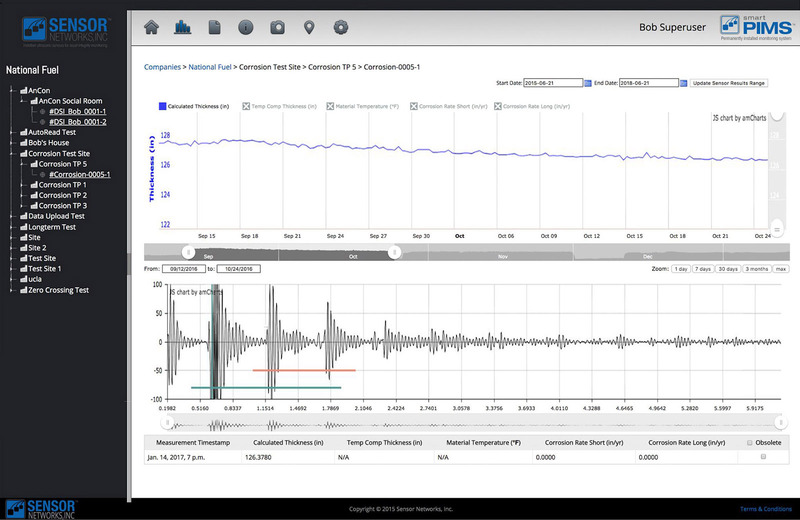 Sensor Networks targets a specialized application of thickness monitoring. In a traditional thickness application, an operator would manually position the ultrasonic sensor on the test piece and read the thickness reported by a handheld meter. This works well if the part you wish to measure is easily accessible and there aren’t too many locations that need to be monitored. This traditional method quickly becomes impractical in the case of a buried pipeline or an oil refinery that may have thousands of critical measurement locations that need to be monitored on a daily basis. Sensor Networks’ solution? Permanently installed sensors wired to conveniently located access points. An inspector can walk up to an access point, plug in, and take simultaneous measurements from hundreds of sensors. Those sensors might be glued to an underground pipeline or strategically positioned on hundreds of pipe elbows located throughout thousands of feet of overhead piping. Most people are familiar with ultrasonic imaging as it relates to medical ultrasounds. Industrial ultrasonic testing is based on the same principles of physics: sound waves traveling through a material will reflect back from any boundary between two materials of different acoustic impedances. Reflections from an area inside a test piece where there should be no impedance differences is an indication that something unexpected and most likely unwanted (a crack or void, etc.) is located inside the test piece. This type of inspection is referred to as flaw detection. It’s also referred to as non-destructive testing (or NDT) because the integrity of a test piece can be verified from the outside without the need to cut into the component. Thickness measurement is a similar application of ultrasonics, but in this case, we WANT to see the reflections. We are looking for the reflection that represents the backside of the test piece. By measuring the time it takes a sound wave to travel through a pipe wall and reflect off the inside surface of the pipe and then back to the outer surface, the thickness of the pipe can be calculated. What makes this such a valuable feat is that Sensor Networks can measure thicknesses without the need to access both sides of the test piece. While still a start-up, Sensor Networks originally hired Art+Logic to build a Windows tablet application (smartPIMS®) that is used during installation to configure the permanently installed sensors and associated electronics and later used to retrieve measurement data from the same sensors. A separate Web-based application (webPIMS®) was developed to collect, analyze, and report on the data. In parallel with our software development efforts, Sensor Networks focused on the electronics. In order to facilitate parallel development, our team created a simulator that we could configure and then use to read back ultrasonic waveforms that mimicked real-world test signals. We were able to test our tablet application and subsequent Web app from end to end without having to rely on fully functioning hardware. The Web application is a Django/Python application with a PostgreSQL database hosted on AWS. Customized interactive Trend Charts and Waveform plots are built using JS libraries from AmCharts. SNI wanted their customers to be able to connect to any provisioned DSI and acquire data measurements from any tablet in their pool of devices. In order to achieve that goal, all configuration information for the Data Sensor Interface (DSI) hardware had to be completely contained inside the DSI unit itself. Similarly, webPIMS® had to be able to accept data directly uploaded from any cellular version of the DSI without any prior knowledge of the DSI. An open, documented data exchange format was created to transmit data between the smartPIMS® and the webPIMS® applications. This format was designed to be easily parsable by any software developer so that customers wanting to ingest these measurements into their own analysis software would be able to do so without difficulty. By applying this level of foresight and extra effort early on in the project, as SNI developed additional hardware sensor platforms — such as an automated DSI that periodically uploads data using cellular networks and a platform that uses Internet-of-Things-style connectivity to upload data — little or no new development effort was required on the Web application. The training and skill-level of personnel sent to acquire measurements from the network of DSIs couldn’t be guaranteed; a series of visual prompts demonstrating the required connection and acquisition techniques walk the user through the process of gathering data. Because the data access points are likely to be in locations that are environmentally hostile (whether inside an oil or chemical plant or along miles of exposed pipelines), the application had to be designed for users in those environments. The app has to be functional despite factors ranging from poor lighting to bulky gloves to beating sleet or blazing sun. Data access points could be isolated in remote locations. The data collection process and the data upload process had to work independently. An indeterminate amount of data could be collected in the field and then, at some later time, uploaded to webPIMS® when a network connection could be established. The first hydrocarbon pipelines in recorded history were in China, in 500 BC, and they were made of bamboo. If laid end-to-end, just the pipelines in Canada would encircle the world 20x. Crude oil moves at a speed of 5 kilometers per hour via pipeline –- roughly walking speed. Learn the lessons of The Lean Startup — a Minimum Viable Product shouldn’t be a huge prototype that incorporates every feature that you can imagine in the final product. Build small, fast experiments that you can use to validate assumptions and build your long-term design around features that customers will actually pay money for. Baking mis-features into a project costs twice: once when you spend the effort building a feature that will go unused, and again when you remove it and replace it with a better feature. One might have expected that beginning development of a hardware-focused project before the hardware was complete would pose the most significant challenge. However, since we’ve frequently encountered and overcome this challenge on other hardware integration projects, our device simulator code was of high-enough fidelity that connecting to the final hardware went smoothly. A more difficult challenge was, as von Moltke said, that “No plan survives first contact with the enemy.” In this case, that contact was at the first tradeshow demonstrations of the system, where some of the initial priority assumptions were disproven. Customer and potential-customer feedback actively shaped and reshaped SNIs vision for a saleable and marketable application. The ability to pivot the application in response to this feedback was essential to the successful launch of the product. Another technical challenge relates to the extremely stringent data security protocols that are prevalent (but not universally or consistently followed) in the target industries. Our Security experts and IT department work closely with those end-users to ensure that our AWS installation is sufficiently hardened. Alternatively, we set up a local, ‘inside-the-fence’ solution to comply with corporate policies that forbid any sensitive data from leaving a company’s local network. When SNI first contacted Art+Logic, we already had domain expertise in the field of non-destructive testing. That domain knowledge created a unique opportunity to collaborate with SNI during their final phase of product design discussions. Being able to speak the client’s language enabled us to envision how to augment the client’s vision with the capabilities of modern software technologies quickly and productively. As is often the case, as soon as SNI’s customer base expanded, so did the vision of what could be done with their product. SNI treats Art+Logic much like an extension of their in-house engineering team. That close working relationship — coupled with our understanding of SNI’s product design and the problem domain — put our team in an ideal position to continue collaborating on ideas that expand the capabilities of SNI’s product line to meet the changing demands of their customers. We understand that SNI’s success as a startup company and their subsequent growth in the industry is due to the talent, hard work, and smart decisions of their team, and we take pride in our contributions to their vision. We look forward to being a productive member of SNI’s product development team as they continue to explore and further expand the capabilities of their technology. Dozens of customers have deployed arrays of SNI’s permanently installed sensors in facilities throughout Asia and the Americas. Early adopters are testing the upcoming IoT (microPIMS®) model that allows for automated uploading of sensor readings to webPIMS® for monitoring and analysis. As customers define new functionality to enhance their use of the product, we will continue to work with SNI in making the system increasingly powerful and useful.